"Play the supernatural hidden object game of Dark Manor." Do you like ghosts? Are you interested in the 1920s time period? What about hidden object games? How about a supernatural hidden object game set in the 1920s where ghosts are your guide? The ghosts help you rather than haunt you. That’s just what you get when you play Dark Manor: A Hidden Object Mystery. 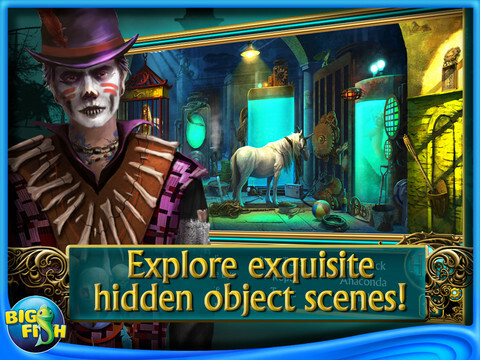 Jump into a supernatural world with bone chilling hidden object scenes ranging from a seemingly easy difficulty to a more challenging difficulty. Explore the history behind the Dark Manor: A Hidden Object Mystery and the ghosts assisting you. Let’s take a moment to discuss the game’s graphics. The game is filled with vibrant colors and breathtakingly beautiful hidden object scenes. The characters are well designed and exceedingly beautiful. Movements and special effects are smooth as the game runs in Full 1080p HD and at a frame rate of 60 frames per second (fps). Dark Manor's great performance does come at a little bit of a cost though. It is highly recommended that your system has over 1GB of free RAM memory when playing this game. This is because the game will peak at around 738MB of RAM when it is being played. If you do not have an adequate amount of free RAM memory, your other computer processes may suffer in performance. This game is not small by any stretch of imagination. The file that you are downloading here is simply a shortcut file that will cue the main download through the Big Fish Games launcher and downloader. The game’s actual size will be much larger.